This recipe is a great alternative to commercial energy bars. It’s got lots of protein, reasonable carbs, healthy fat, plus it’s high in calcium and magnesium for strong bones. I prefer to get my nutrition from whole foods, and this has been one of my favorite snacks on long bike rides. The recipe is VERY forgiving. Once you’ve tried it and get the hang of compressing it enough to cut into squares, feel free to experiment with other nut butters and different seeds. The oats are critical to giving the bars structure, but everything else is negotiable. I’ve made these with combos of sesame, flax, hemp, and chia. Sesame is really high in calcium and a little bit bitter so you might want a bit more sweetener if you use these. Flax is a great source of omega 3s. Hemp adds lots of protein. Chia is also a calcium powerhouse. I pretty much HATE the flavor of flax, but if you love it, this a super way to get more into your diet. Line an 8×8 pan with parchment, foil, or plastic wrap. 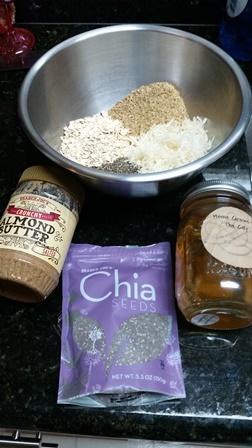 Mix oats, coconut, sesame, hemp, and chia in a bowl. Combine almond butter, honey or molasses, and vanilla extract in another bowl. Warm it slightly over a pot of hot water to make it easier to stir if needed. Combine the oat mixture with the almond butter mixture and stir until the oat mixture is well coated. Once everything is well combined, slop it into the prepared 8×8 pan. Mash it down well and into all the corners. You can even use a second 8×8 pan to smoosh it more thoroughly and evenly. It should look fully compressed, sort of like a commercial energy bar. Refrigerate for 30-60 minutes until it is firm, then lift out everything out of the pan by the parchment/foil edges onto a cutting board. Slice it into squares and store in an airtight container in the fridge. This entry was posted in Food and Recipes and tagged bone health, calcium, energy bars. Bookmark the permalink.